Since we spent most of the day talking about films and how they re-tell stories or bring stories to life I wanted to throw one of my recent favorites into the pot. Kubo and The Two Strings is certainly more of an adventure film than a horror film, but this stop-motion journey from the studio that created Coraline is steeped in Japanese mythology and imagery. Kubo and the Two Strings, set in late-ancient Japan is, at its core, a story about family. It just so happens that Kubo is a descendant of the Moon King, and in that lies the conflict. Kubo’s mother wants for her son to live the life of a normal human, experiencing the feelings of humanity for better or for worse. Kubo’s grandfather wants to bring Kubo into the family business of ruling over the heavens in a cold, dispassionate eternity. When the Moon King finally gets wind of where Kubo and his mother are hiding he begins an arduous search which thrusts Kubo into a journey helped only by a monkey and a samurai beetle. Not to mention Kubo’s own magic powers which he channels through his trusty shamisen (pictured below). For fear of giving away the rest of the story that is where I will end my summary. Given the setting of late-ancient Japan, the story is rich with the ideas, practices, and mythologies of the Japanese around this time. Ancestor worship, Yokai, and magic play a major role in the plot. There are many scenes in which characters of varying importance speak about the importance of honoring ancestors and conversing with those that have departed. Also, the outcome of a climactic scene is directly impacted by the bonds of the characters and their ancestors. As for Yokai, the giant skeleton that is represented on our syllabus is a key antagonist, as well as dragons and sea monsters. Most importantly the magic shamisen that Kubo plays is almost a character in its own right. 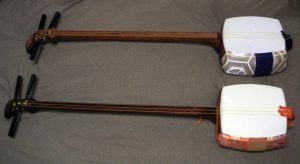 This shamisen is the vessel of Kubo’s magical power which creates a very interesting dynamic and an even better soundtrack. The creators of the film showed care and attention to detail when crafting this tale and its setting. So much so that I was able to watch it and pick out points that we explicitly went over in class. Overall, Kubo and The Two Strings is a very good film with a lot of heart and excitement. It is a gorgeous film that is very easy and enjoyable to watch, while also keeping the mind engaged about how we understand storytelling in our modern age. Also, it gives wings to the words and lectures we read and hear in class, driving the points just a little bit closer to home. Overall, Kubo and the Two Strings is great viewing for anyone who likes adventure and has enjoyed the class so far. Stay tuned for more updates from Shudan Borei on the podcast and other interesting posts.